Established since 1992, we have offices in Vancouver (British Columbia), Toronto (Ontario) and Québec (Québec) and specialize in canadian certified natural organic healthy products. With our grocery distributors, we currently supply health food stores, supermarkets and processors across Canada. Béland Organic Foods’ policy is that all organic products are manufactured from organically grown ingredients. No food additives, G.M.O.’s (genetically modified food), artificial colouring, chemicals or preservatives are used during any of the organic farming process. All Béland Organic Foods’ organic products undergo rigid quality control so we can ensure the highest quality and freshness. Please enjoy our site. If you require further information about any of our products and services, please do not hesitate to contact us. We welcome your comments, questions and suggestions! After 5 years in the salmon farming business, in 1992 Martin Béland began selling his own brand of certified organic maple syrup “Canadian Heritage Organics” in and around Vancouver and Victoria. Canadian Heritage Organics was the first readily available brand of certified organic maple syrup in the Western Canadian marketplace and is now a well-established national brand. Martin quickly branched out from strictly maple syrup sales creating “Beland Organic Foods” which has since expanded into almost every category in the natural foods business. This success was achieved through Martin’s strong business skills, good ethics, and sheer tenacity. Martin continues today as the president and owner of the Béland Organic Foods. In this role, he oversees all operations and keeps a careful eye open for new Canadian manufacturers that might be a good match for his company’s expertise. Because Martin is so dedicated to the hard-working food producers and manufacturers of Canada, he loves to help them achieve their financial and sales goals. Between business trips all over the country (and all over the world!) Martin enjoys hiking and cycling around his quiet rural home outside of Quebec City. Martin is a true organic foods pioneer whom sees himself as a French and English speaking chameleon in the industry. At the most basic, he’d like nothing more than to share a good meal with anyone in Canada. “I am very happy and fortunate to be working with all of my highly committed team members.” M. Beland. Living in Vancouver (BC) Canada for the past 10 years, Francisco has developed a passion for food, with his experience in retail and wholesale and a combination of his studies in Business Administration and International Commerce degree. He has learned that the market is more demanding every day and that our society requires a higher level of satisfaction when it comes to fulfilling its needs. He enjoys negotiating prices and selecting quality products that have great potential in the local markets as well as establishing good relationships between the manufacturers and retailers. Joining the Beland Organic Foods team, he will lookover the merchandising and sales as well as identify opportunities for growth and development of the organic market in western Canada. When he is not at work he is training for IronMan Triathlon or relaxing with friends and family. Established in 1992, Béland Organic Foods is an organic food broker, wholesaler, as well as producer of Canadian Heritage Organic maple products and Karthein’s organic unpasteurized sauerkraut with probiotics. Béland Organic Foods aims to do its part to reduce Greenhouse Gas Emissions (GHG), slowing down the global climate change by compensating for the GHG emission caused by the transport of its organic lines. 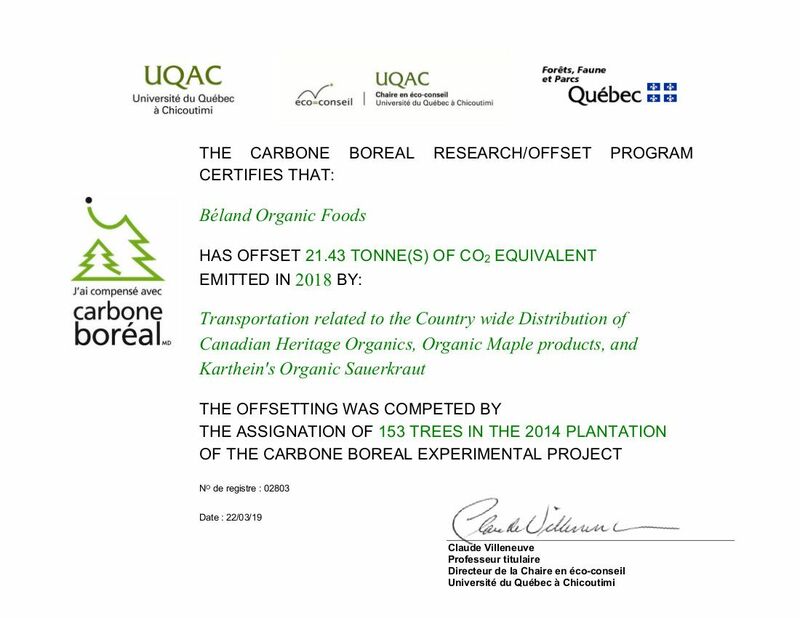 Béland Organic Foods purchases carbon credits from the Carbon Boréal research program, which provides and plants trees that will ultimately offset their GHG emissions linked to all deliveries made in 2018. This is calculated using the total number of kilometres done on by truck or train from origin to destination point of all the orders delivered across Canada. To date, the equivalence of 199,43 tonnes of Co2 was offset by the planting of 1,424 trees, as can be seen on the certificate issued by Carbon Boréal. We hope to inspire other organic health foods companies and individuals to join us in becoming carbon neutral. Take action or find out more on the Carbone Boreal Program.